The dominant seventh flat five chord (7b5) is a dominant seventh chord with a fifth lowered by a semitone. It is built with a root (1), a major third (3), a diminished fifth (b5) and a minor seventh (b7). 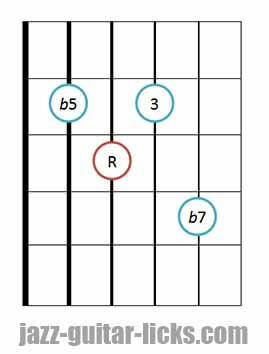 The dominant b5 chord is an extremely important sound in jazz music due to its dissonant and unresolved sound. What's the difference with 7#11 chords. Because this topic is often confusing, it is important to make it clear. 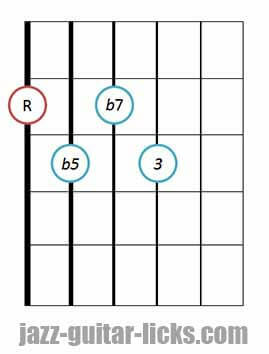 By taking a dominant 7 chord, R, 3, 5, b7, and lowering the 5th by a 1/2 step we obtain the following formula : R, 3, b5 (#11), b7. Because the flat fifth (b5) can be considered as a sharp eleventh (#11), 7b5 and 7#5 chords are often confused. Dominant seventh sharp eleventh chord symbols (7#11) arise often in big band charts and standard tunes. But in theory, these two chords are completely different. 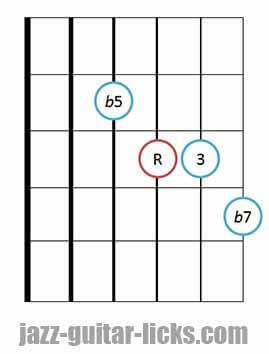 Dominant 7b5 chords imply only 4 notes, unlike 7#11 chords are made up of 6 notes. However, all the 7b5 diagrams shown below can serve as dominant 7#11, but the ninth and the perfect fifth will be omitted. 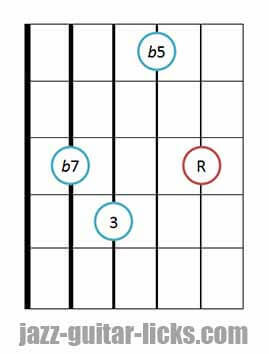 Dominant 7 flat 5 chords can be written 7b5 or 7(b5). 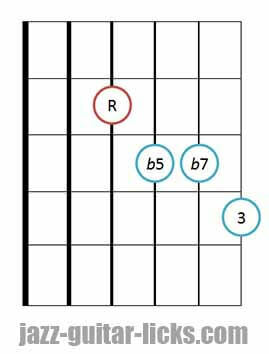 7b5 chords can be extended with : b9, 9, #9, b13, 13. 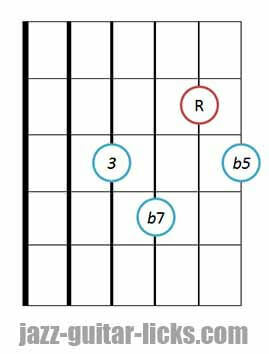 Here are the 4 dominant 7b5 drop 2 voicings related to the twelve guitar diagrams below. One thing to know is that there are only two different fingerings for any 7b5 chord on any string set. You only need to learn two different fingerings per string. Root position - 7b5 chord - Root in the bass - Bass on E-string. 1st inversion - 7b5 chord - Third in the bass - Bass on E-string. 2nd inversion - 7b5 chord - Flat fifth in the bass - Bass on E-string. 3rd inversion - 7b5 chord - Minor seventh in the bass - Bass on E-string. 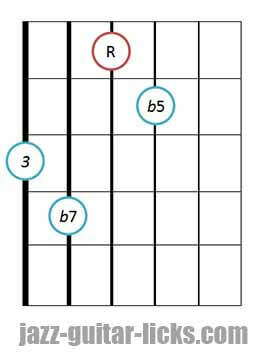 Root position - 7b5 chord - Root in the bass - Bass on A-string. 1st inversion - 7b5 chord - Third in the bass - Bass on A-string. 2nd inversion - 7b5 chord - Flat fifth in the bass - Bass on A-string. 3rd inversion - 7b5 chord - Minor seventh in the bass - Bass on A-string. 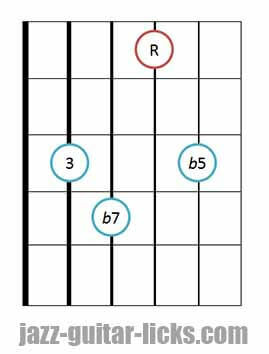 Root position - 7b5 chord - Root in the bass - Bass on D-string. 1st inversion - 7b5 chord - Third in the bass - Bass on D-string. 2nd inversion - 7b5 chord - Flat fifth in the bass - Bass on D-string. 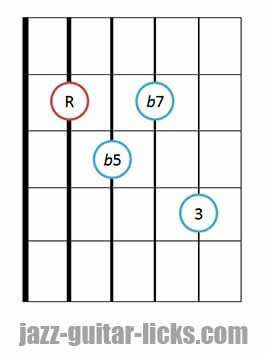 7b5 chords are often used in jazz standards, giving a distinct sound flavor.Try to substituting ordinary dominant 7th chords with 7b5 chords in your favorite songs. A common chord substitution found in jazz is where the V of a II V I sequence is replaced by a dominant 7th chord whose root is a tritone below. Here is a first example with Dm7 | G7 | Cmaj7. Db7 can be in place of the G7, thus giving Dm7 | Db7 | Cmaj7. This is a great sound because with this kind of substitution, the root of the V chord is chromatic. We get a bass line descending by half steps (D to Db to C). This kind of downward trajectory produces a pull towards the tonic chord. It is often a nice and featured sound in jazz. Now that is where the 7b5 chord comes into play. Indeed, you can play it instead of the Db7. In other words, you just have to lower the fifth by a semitone, giving Dm7 | Db7b5 | Cmaj7. This way the b5 of Db7b5 (G) is none other than the V of Cmaj7. Another example using drop 3 chords, in the key of Bb with a chromatic descending bass line (C, B and Bb).